My daughter loves doughnuts, really loves doughnuts. It was school holidays and I was flicking through my magazines, tearing out recipes when I came across this one. I had to make them. These take about 5 minutes to make in a food processor, they couldn't be any easier. You could do it with a hand mixer if you don't have a food processor. They looked perfect and they tasted great. Do they taste like doughnuts, no, they are more like a cupcake, the batter is a cake batter. But we loved them. There was leftover glaze, but don't fret it is perfect over vanilla ice cream, so no waste. Or serve vanilla ice cream with your doughnuts topped with glaze as a dessert. YUM! Chocolate heaven. These would be great for parties, really fast to make and they do look great. Now if you don't have a piping bag or nozzles, just fill a snap lock bag with the mixture and make a 1.2 cm opening and pipe it out that way. I'll be making these for years to come, hope you do to. Preheat oven to 200C/180C fan forced. Grease 12 mini doughnut pans lightly with oil (I used the spray). Process the flour, sugar, cocoa, eggs and butter in a food processor until well combined. Add milk and process until smooth. Transfer mixture to a piping bag fitted with a 1.2cm plain nozzle. Pipe the chocolate mixture into the prepared pans, taking care not to overfill. 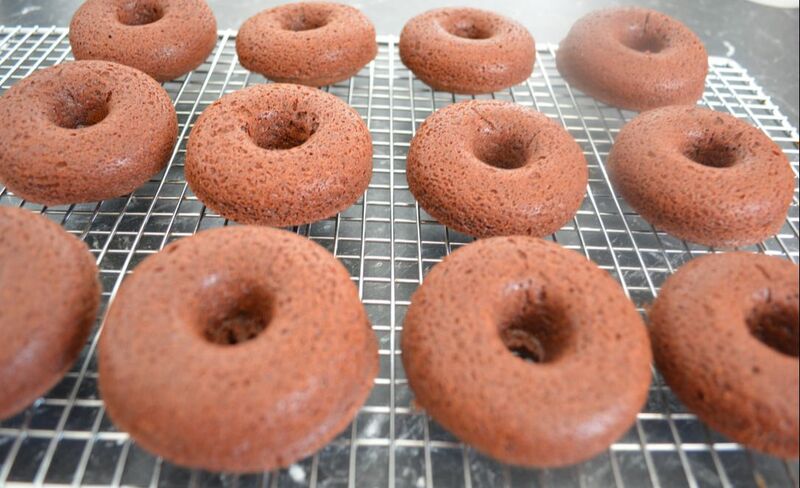 Bake for 10 minutes or until a skewer inserted in the centre of doughnuts comes out clean. Transfer to a wire rack to cool. Make the chocolate glaze: Combine the dark chocolate, cream and butter in a saucepan over low heat. Cook, stirring, for 6-8 minutes or until melted and smooth. Set aside to cool slightly. 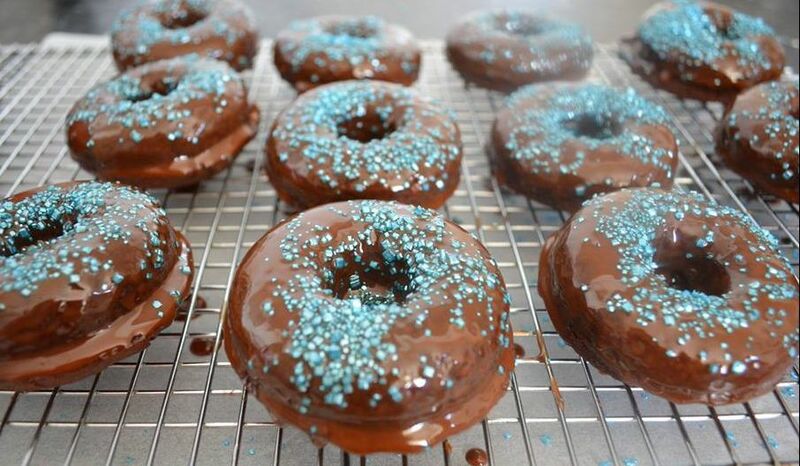 Dip doughnuts in glaze. Place glaze side up, on a wire rack (or over a sheet of baking paper, so no mess). 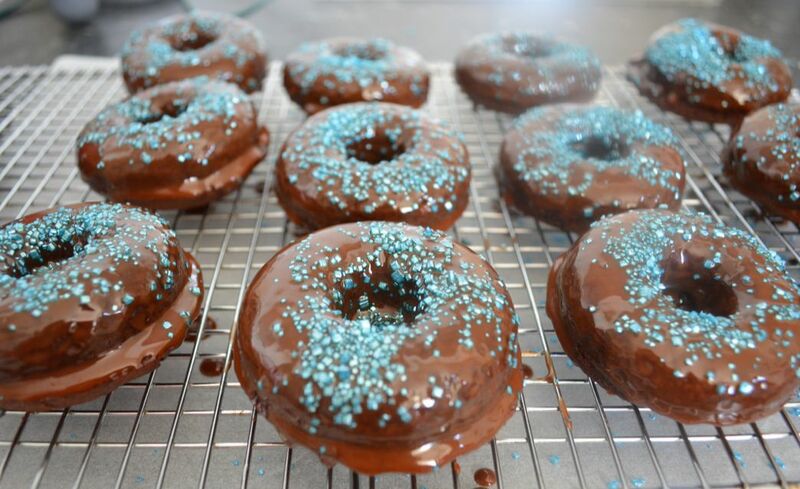 Decorate with sprinkles. Set aside to set.